Sine is committed to providing quality products and services that conform to our customer’s requirements. We will have an environment which encourages team work and in which each employee learns, understands, and practices quality conformance as an integral part of his or her job function. All departments will establish goals consistent with our commitment to continuous improvement. A solid R&D capability must be established for long-term development. We have a team of experienced technicians and professional engineers who have been working in this field for many years. The company invested in advanced testing equipment for better quality assurance. We not only utilize advanced manufacturing、testing and experimenting equipments, but also adopt advanced managing methods- ERP、bar code and so on, these improve our process control capacity greatly. Doing weight loss test on magnet substrates under the condition of high temperature, high pressure and high humidity. 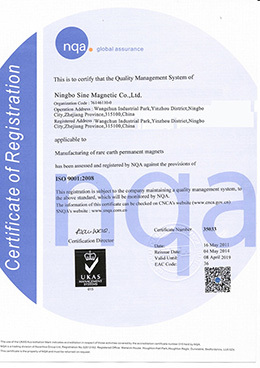 The number of weight loss could indicate the application life of magnet. 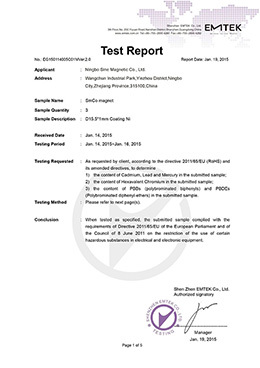 According to IEC68-2-66, HAST test 20 days, the best weight loss of our product could be less than 1.5 mg/cm2. Our aim is to make coating never peel off the substrates. Our products perform well in crosscut, or PCT, or thermo shocking test. 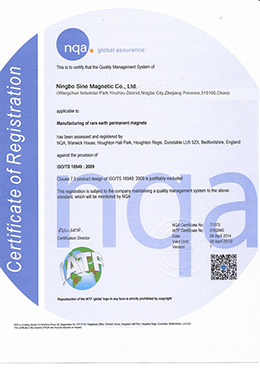 Homogeneity of magnet material for one batch and continuity among batches will offer strong support to customer’s product quality and large MP production. With the development of high technology industry, more and more applications need NdFeB products with high working temperature. Now, we can produce EH and AH serial material and magnets. Working temperature could reach 200°C. Our NiCuNi+Epoxy coat could pass 1000 hours in Salt-Spray test.